A wonderful night was had by all tonight down on the riverbank!! Thank you to Rev Alan Piggott & friends from St Mary's Church in Eastway for the spiritually uplifting songs. Together with the residents - we almost brought the walls of the Olympics down - maybe next time!! Thank you to Tracy and Simon for the fantastic mulled wine and barbie!! The evening was actually quite warm - but you four (Cosmo & Chester - their biscon frise's as well) really made the whole evening sizzle with your burning wood & delicious mulled wine!! Thanks to Zoulla for you brilliant Xmas tree - putting the spirit into the lovely evening!! Thanks to Stuart, Bella & Debbie - plus Debbie's mum - for the scrumptious cookies!! Thanks to Nadira for the teas, coffees, hot chocolates, star & Xmas tree cookies & most importantly - glow sticks!!! But most importantly - thanks to everyone who came along!! This is just the kind of community event the riverside was built for!! A brilliant evening with the best of friends!! This is a rather formal blog entry - but what it is - is an invite to attend the annual general meeting of our local Hackney Wick Community Association. Remember - this is your local association - and the more of us who attend this meeting - the more say we have over where it heads in the future! We all have views about how the Community Centre is run - and now is the most ideal time to shape the future of this amazing place. PLEEEEEEEEZZZZZZZZ try and make it down to this very important meeting!!! 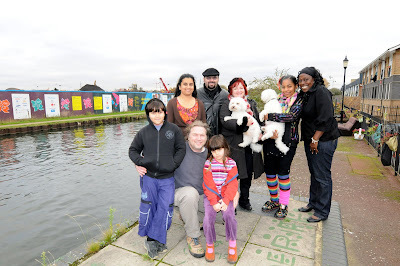 The Hackney Wick Community Association gives notice that the Annual General Meeting of the Board is to be convened 19 January 2009 at 7.00 pm. For business to be conducted at this meeting we require a minimum of 25 Full Members of the Association to attend. At the meeting it is proposed to elect three (3) Full Members to the Board of Trustees for the Association. Nomination forms are available to collect from HWCA, requested by phone (020 8986 1999) or email (h.w.c.a@btconnect.com). Nominees must be Full Members of the Association and proposed and seconded by existing Members. Members of the public wishing to become Full, Associate, Affiliated or Junior Members of the Association are invited to request a membership form using the above contact details or to visit our building to complete the form. All residents of the local community within the Parish of St Mary’s of Eton are eligible to become Full & Junior Members. Residents outside of this boundary are welcome as Associate Members. Local training, education, sports, and other organisations with an interest in our community are welcome as Affiliated Members. We look forward to welcoming you at our EGA. Local residents are invited to contribute a photo of Well Street Common suitable for use as a Christmas/seasonal card. The winning photo will be printed and cards available for Christmas 2009. They will be for sale in aid of Well Street Common User Group projects. Preferably digital, by email attachment or on a disc. Closing date 31 March 2009. Thanks to Councillor Christine Boyd for this blog entry!! A great bunch of our neighbours know that we could ALL do with some cheering up at the moment! The amazing folk at St Marys Church in Eastway http://www.stmaryofeton.freeuk.com/) have kindly volunteered to come and sing some uplifting carols for us here in Leabank Square. 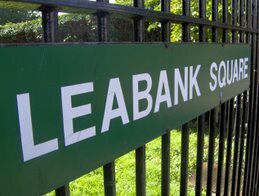 They will be making their way down from the Pensioners Club (where we normally vote) at the top end of Hackney Wick Green (next to the Costcutters at the number 30 bus stop) all the way to the Leabank Square Green. Once here (roughly 7.30pm) - they will welcome any carol singers from amongst us - to join them in cheering the whole Square up from the green. We will all then proceed to the Riverbank to see if we can drown out the Olympic noise with great music. There will be teas, coffees and mince pies for everyone to warm up with. Once you have sung and had a cuppa - the procession will then make its way to the wonderful community centre at Living Space (41 Felstead Road) for another few songs. You are more than welcome to join the group for the short walk up Felstead Road. We all know that Leabank Square is made up of many diverse religions, faiths, ideologies & creeds - but we have had a very rough year with all our trees chopped down and noise & dust coming over from the Olympic site - that no matter your personal beliefs - a great sing-a-long will do us all the world of good. As the Rev Alan Piggott says - It will be wonderful for us all to just simply meet each other and have a cuppa & a few mince pies together! Come on Leabank Square - lets get into the festive spirit - and have a great evening together. As you can see in the pics above - the trees that we all spent years planting, watering, loving & picnicking below - are all gone. It seems all the more sad to look at now - as the new alternative view is one of sand, trucks & dust!! But to top it all the Olympics seem to think that we can't see enough construction - and put up huge posters of more sand, trucks and dust!?!? I have written to Georgia Sharp (Community Liaison Officer) and asked if she knows of any plans to Green the Greenest Olympics for us. I'll let you know what she says as soon as she replies. The time has come to talk trees. Or more importantly – greenery. George kindly offered to offer me a place on a garden workshop a few weeks ago, but I wasn’t able to get time off work unfortunately. So maybe you have all covered this ground so to speak. As you probably know – residents of Hackney Wick lost their fantastic trees and gardens all along the tow-path when the wall went up. Although we could see some of the taller trees that we planted for a while, they have now all been felled. As this is the first winter without our community planted trees – the full impact of what happened has just hit us all with dreadful gloom. Not only has all the greenery gone - it has been replaced with mud, machinery and construction. To go from one extreme to another in such a short time is having a profoundly negative effect of Leabank Square, especially those of us lucky enough to have waterfront views. So my question is fairly simple, and I hope it has an equally fairly simple answer. Are there any plans to re-plant the tow-path along the Lea River Navigational Canal soon? By soon – I mean very soon. It's the first of December..... and that can only mean ONE THING!!!!! The annual Leabank Square Xmas Lights Big Switch On!!!! Each & every year 'Z' dazzles Leabank Square with her amazingly decorative light display. And it gets better every year!! What about next year we have a band playing - with maybe mulled wine and mince pies - and a massive switch for 'Z' to turn on?! Thanks Very Much to you 'Z' for bringing festive cheer and Sparkling colour to Leabank Square during these dark & grey days!